Adam Ostolski is a sociologist, activist, philosopher and translator, who teaches sociology at Warsaw’s Medical University. His academic interests include gendered nationalism, social memory, psychoanalysis, Jewish studies, the sociology of knowledge and the study of social movements. Adam is also known for his political activism and is the joint leader of the Polish Green Party, Partia Zieloni. 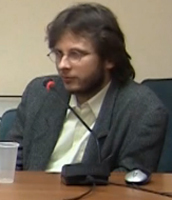 He is also a founder member of Krytyka Polityczna and in 2012 he wrote regular columns for the magazine, Przekroju.